Greater Celandine plant, Chelidonium majus, is historically a herb for the eyes. Traditional European and Asian folk use of leaves as a remedy for asthma, gall bladder problems and liver problems. The orange sap from stems is used a remedy for warts, corns and ringworm. Unrelated to Lesser Celandine. Greater Celandine plant is native of Europe and prefers moist, rich soils in a protected, sunny position. Flowers are bright yellow and occur in spring, summer and autumn. Drought and frost resistant. 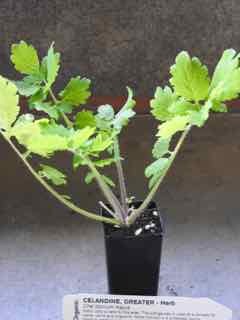 A herbaceous perennial or biennial plant, growing to 0.4m x 0.5m. Be the first to review “Celandine, Greater plant” Click here to cancel reply.